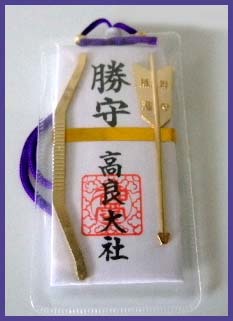 to test their good luck for the new year.
. kanju manju 干珠満珠 tide jewels . is a prestigious, and the largest shrine in the region as the first shrine in Chikugo　筑後. It is an Engishiki-nai Myojin Taisha (a shrine dedicated to specific gods under the Engishiki Code), and one of the former second-ranked, larger shrines. Its dedicated god, Kora Tamatare no Mikoto, is said to have been bestowed the highest rank by the Imperial Court. Its sanctuary was built in 400 A.D. (First Year of Emperor Richu) for the first time while older ritual sites remain in a mountain. Kora Taisha Shrine is one of the oldest shrines in Kyushu, and used to be honored as a mausoleum of Kyushu. It is especially deeply worshiped by people in the Chikugo and Hizen Areas. Worshipers are famously thought to be blessed with warding off bad luck and prolonging life. The current sanctuary is designated as a significant cultural asset by the government, and is one of the largest sanctuaries in Kyushu.
. Legends from Chikugo 筑後 . takes place on the evening of January 15 at Kōra Taisha in Kurume City, Fukuoka Prefecture. The ritual occurs with the presentation of a golden ball and a silver ball as well as offerings (shinsen) before the kami (shinzen). At eleven o'clock a person carrying the two balls is placed in the completely darkened keidai (shrine grounds), and the worshippers exchange wooden balls with one another in the dark. 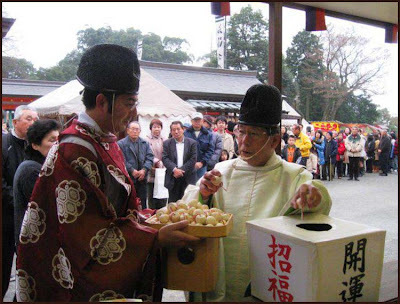 After about an hour the lights are turned back on; the persons holding the gold and silver ball serves in an offering and thanksgiving ritual (hōsai) on the following morning. The two balls are regarded as the two balls that control tidal ebb and flow. A Tamakae shinji is also held at Miyajidake Jinja in Tsuyazaki Town, Munakata County, Fukuoka Prefecture, on January 21. Tamatorisai held on April 16 at Kamato Jinja in Daizaifu City, Fukuoka Prefecture. 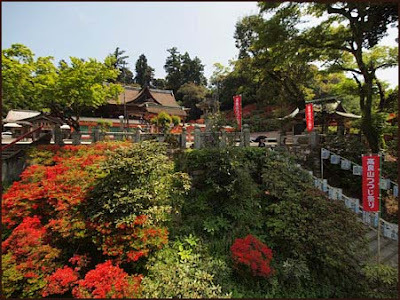 The shrine is also famous for the azalea festifal in May. The shrine was built in the 5th century. At a height of 312 meters (1,024 feet), Mt. Kora stands on the westernmost edge of the Mino Mountain Range. On this mountain you will find Kora Taisha Shrine, a former National Shrine and a major shrine in the Chikugo region. The construction of Kora Shrine is said to have taken place in 400 AD; it was ordained one of the highest ranking shrines in 897 AD and had an elevated rank within the Engishiki (a book of laws and regulations) as a shrine dedicated to gods worshipped at critical times. Kora Taisha is a historical shrine in that its power of influence during the middle ages came to compete with that of central government officials sent to oversee the province. It is also known for being the place that received the prayers of Prince Kanenaga Shinno, who established a residence at the base of the mountain in the Nanboku-cho Period (1336 – 1392). The main sanctuary, offering hall and worship hall that we see today were built by the third Kurume feudal lord Arima Yoritoshi, and each is has been deemed an Important Cultural Asset by the government. 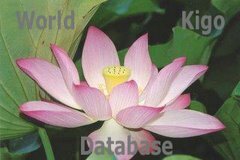 “The Origins of Kora Taisha Shrine Colored Silk Hanging Scrolls” (Municipal Designated Cultural Asset), and other such treasures. A forest of a moso bamboo species (a designated National Natural Treasure), Kogoishi Rock (Government Designated Important Cultural Asset and Historical Site), and other precious sites are also preserved on Mt. Kora. is held from October 9 through 12 every year. It is the shrine’s biggest festival that proclaims the presence of the Shinto god Kora. During this three day festival, Kora Taisha Shrine comes alive with traditional cultural events like the Lion Dance and Furyu (a musical and dance performing art), Japanese archery exhibitions, and dedicatory performances of various martial arts!
. hanakae 花換祭 / 花換祭り Flower-exchanging festival . usokae shinji , Bullfinch-exchanging rite. A rite held during the night of January seventh at the shrine Dazaifu tenmangū in Dazaifu City, Fukuoka prefecture. Bullfinches (uso) made of wood are used as charms against fire. People take their bullfinches that are covered with the preceding year's grime to the Tenman shrine, and everyone exchanges bullfinches with anyone else freely, saying "kaemashō, kaemashō " ("Let's trade, let's trade"). During this excitement the shinshoku (shrine priests) lose themselves among the crowd of worshippers and walk about surreptitiously passing out the shrine's twelve bullfinches. Those who get one of the gold bullfinches are said to receive good fortune for the year. The festival called onisube, famous for protection from fire, is observed after the bullfinch festival. Two groups of nearly one hundred people each are divided into the "demon guards" and the "smoke handlers." The latter light a huge mound of fresh pine piled up outside of the shrine hall with sacred fire (or by rubbing two sticks together), and fan the smoke into the shrine with an enormous fan. On the inside the demon guards beat the slat board walls with wooden mallets. Then, drawn by torches, the smoke-covered demons try to go around the shrine, but the shrine priests throw parched beans at them. People strike the demon masks that the performers wear with staffs called utsue. After going around the outside and inside of the shrine through the smoke and ash the demons come to a stop. The usokae shinji at the shrine Kamadotenjinsha in Kōtō-ku, Tokyo is said to have been brought from Dazaifutenmangū. 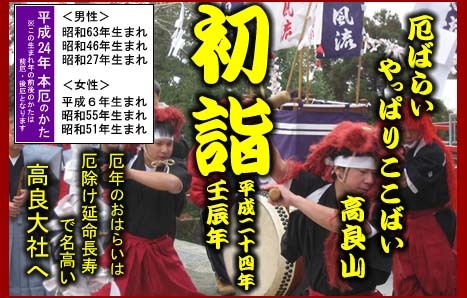 On January fifth there is an usokae matsuri also at the shrine Meihamatenmangū in Fukuoka City, Fukuoka prefecture. Similar to the bullfinch rites is the hatokaeshi shinji (dove-exchanging rite) at the shrine Usajingu in Usa City, Ōita prefecture. There is a tamakaeshi matsuri (gem-exchanging festival) on January twenty-first in which tama gems are traded at Miyajidake Jinja, Munakata-gun, Fukuoka prefecture. and the hanakae matsuri (flower-exchanging festival) at the shrine Kanezakigū in Tsuruga City, Fukui prefecture. ***** . Hekokaki Festival へこかき祭り.